Week 14 CFP Implications: Who's In? Week 14 CFP Implications: Who’s In? Who should win the battle for the fourth CFP spot? This is always the question the final week of the season. With Ohio State’s unimpressive performance against Northwestern, the selection committee won’t really look at the Buckeyes. Similarly, the committee won’t give undefeated UCF the attention it deserves, either. That leaves just Oklahoma and Georgia. Both will certainly be considered, and the committee has plenty of time to discuss the two. Who will be in? Let’s compare the resumes, after the Eliminator. We are winding down another season of my CFP Eliminator. If you’re not already following, I’ll be eliminating teams throughout the year in this Twitter thread. I eliminated teams as we reach a stage where, in a year even with extreme chaos, there’s no reasonable scenario for that team to make the Playoff. Obviously, it’s theoretically possible for every team to end up about 6-6. But that’s far from reasonable, so I’m not worried about that possibility. 2007 was the most chaotic season in recent history, so my benchmark question always is, “Is there a scenario that gets this team in the Playoff? Does that scenario require significantly more chaos than 2007?” If the answer to that second question is “yes,” then the team is eliminated. We entered this week with seven teams still alive. Notre Dame, Alabama, and Clemson have clinched Playoff spots. That means that the final spot is between the three bubble teams: Oklahoma, Ohio State, and Georgia. Oklahoma clearly has the advantage, but it’s close enough that there is an actual bubble. Alabama is in. Clemson is in. Notre Dame is in. Who’s the fourth? Let’s look at the resumes. The selection committee has mentioned, multiple times, that “wins over teams with winning records” is a meaningful stat. It’s a silly stat (it makes beating a 7-5 Sun Belt team better than a 6-6 Power 5 team), but the committee says it matters, so I include it. That number is good for Georgia, and the SOS numbers are better, but the rest leans towards Oklahoma. The Sooners have the same number of Top 25 wins (including the win over Army), one fewer loss, and have the best offense in the country, by far. 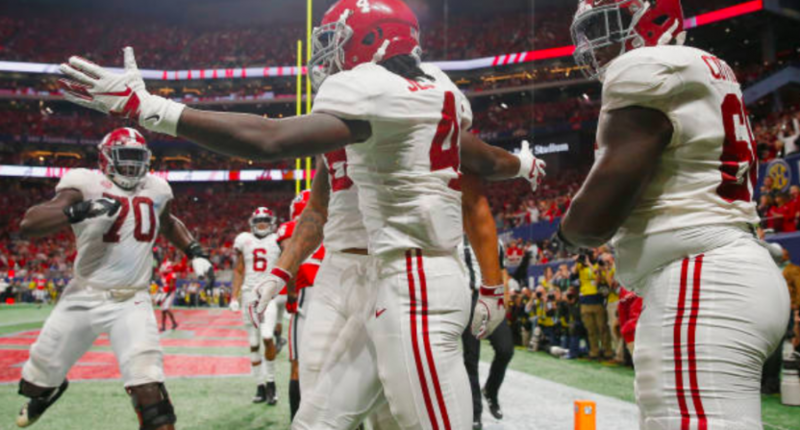 Maybe subjectively plenty can say that Georgia would give Alabama a better game–and that will certainly be mentioned in the committee room–but it’s hard to say that it will be enough to be willing to give an instant rematch in the semifinals. Oklahoma will be in. Ohio State has the best win of anyone in this group (over Michigan), but everything else aside from that lags behind, plus the loss is much worse than Oklahoma’s (and both of Georgia’s, combined). The Big 12 has already said that it would send Texas to the Sugar Bowl. UCF will go to the Fiesta Bowl since it went to the Peach Bowl last year. Since the three at-large teams will be Michigan, Florida, and LSU, that means Michigan has to go to the Peach Bowl to avoid a Florida vs LSU rematch. Florida or LSU could go to either game, but I think the committee will send LSU to the Fiesta Bowl to avoid an all-Florida game in Arizona. No NY6 bid for Texas means that Penn State slides in to these games. Florida moves up to the Sugar Bowl. Because Penn State played in the Fiesta Bowl last year, Michigan moves into that game against UCF. That leaves LSU against Penn State in the Peach Bowl.